A free and open-source Hugo theme. Great for blogs and easy to customize. A free and open-source Jekyll Hugo theme. Great for blogs and easy to customize. 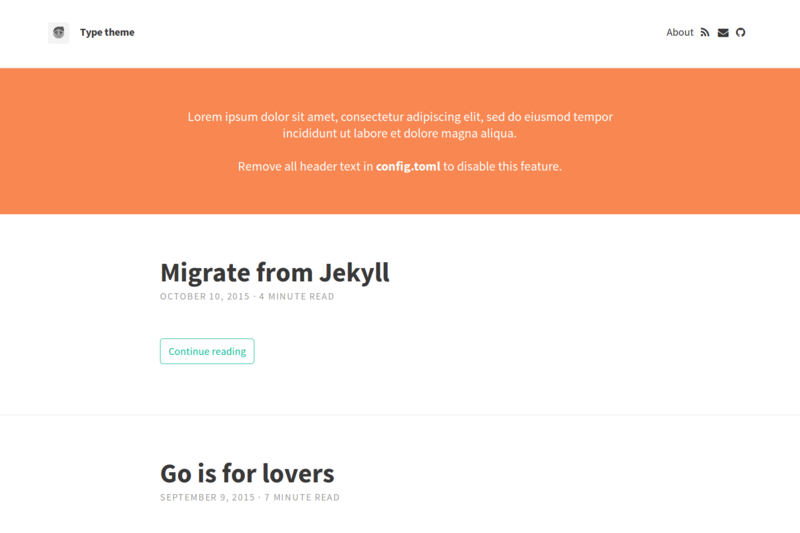 This theme is a port of the original Type theme made by Rohan Chandra. Noteworthy features of this Hugo theme are the integration of a comment-system powered by Disqus, Google Analytics and localization (l10n) support. You should see a folder called hugo-type-theme inside the themes directory that we created a few moments ago. For more information read the official setup guide of Hugo. Next, navigate to the exampleSite folder at themes/hugo-type-theme/exampleSite/. In order to get your site running, you need to copy config.toml and all the content of all relevant subfolders such as data/l10n.toml into the root folders. To turn the exampleSite folder in a standalone demo site the themesDir property has been set to ../... This way you can preview this theme by running hugo server inside exampleSite folder. Due to the customized themesDir path Hugo will fail to find themes if you copied the config.toml into the root directory of a regular Hugo website. Make sure you comment out the themesDir property if you use the theme in production. Now, let us take a look into the config.toml. Feel free to play around with the settings. The optional comment system is powered by Disqus. Enter your shortname to enable the comment section under your posts. With the disableComments frontmatter parameter you can disable the comment section for each page individually. The same applies to the activation of Google Analytics. Enable it by entering the tracking code for your website. You can define menu entries as you like by linking a post or any other site. First, let us link a post that you’ve written. We can do this in the frontmatter of the post’s content file by setting menu to nav. That’s it. You don’t blog in English and you want to translate the theme into your native locale? No problem. Take a look in the data folder and you’ll find a file l10n.toml that we’ve copied at the beginning. It contains all strings related to the theme. Just replace the original strings with your own. This way you can store them either next to the content file or in the static folder. If you want to tell your audience who you are create a new file called index.md under content/about. For an example look at exampleSite/content/about/index.md inside the theme folder. In order to see your site in action, run Hugo’s built-in local server. Now enter localhost:1313 in the address bar of your browser. Have you found a bug or got an idea for a new feature? Feel free to use the issue tracker to let me know. Or make directly a pull request. This theme is released under the MIT license. For more information read the license. Steve Francia for creating Hugo and the awesome community around the project.